Cruising the Hisaronu Gulf with Forrest Yoga teacher Katrin, means exploring your inner beauty and the beauties of the Turkish Agean Sea. Able to connect with people of all backgrounds and speaking global truths, Katrin’s passion is to ignite the spirit and explore the great mysteries life beholds. A complete boat can be yours, just bring your friends together and you are only your party on a traditional wooden Gullet. Such a trip is also a good idea for clubs and other parties. From 10 persons onward we reserve a boat for you at cabin charter prices and suggest the best itinerary. Today's visitors enjoy exploring submerged Lycian ruins best viewed by private boat charter." 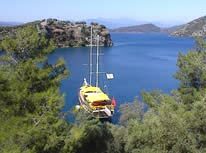 This Blue Cruise into the Hisaronu Gulf offers diverse and amazing coastal scenery, including numerous bays of various sizes, peninsulas, mountains, pine forests, and flat plains. A coastline could hardly be more different. South of the long drawn Datca Peninsula, the Gulf nestles elegantly around the Greek island of Simi. On the "Hisaronu" itinerary you will find historical sites like the ruins of ancient Loryma, many wonderful and breathtaking bays, and cozy fishing hamlets like Bozburun and Selimiye. Your holiday will be a relaxing combination of yoga and sailing the turquoise waters of Turkey. "Kilunda Yoga is a sanctuary for holistic existence, playful exploration and creative expression. Guided by African and Native American spiritual concepts guests are lead to work through blockages, softening and strengthening their heart and their body with the aim to unleash their true potential through the powerful practice of Forrest Yoga. With its strong rooting in the elements of Earth and Water and its deep emphasis on Natural Freedom, Kilundayoga Blue Cruise is a soul-enriching way of experiencing the benefits of Katrin’s Yoga teachings, which can be applied on and off the mat in every day life." On this cruise you will not be with a crowd. You share the boat with just a few other couples or single travellers, having your own crew there to attend to your needs. You may participate in sailing and will have the chance to explore every little bay on your route. Your floating home will be 18-24 meters (55-74 feet) long, 6-8 double cabins with en suite toilet and shower. Sailing, snorkelling, fishing or sunbathing are some of the activities on board. All meals will be served by your cook. "Forrest Yoga teaches how to bring aliveness, using breath, into every cell of your body. It is an intense physical and internally focused practice based on traditional Yoga from the east, but adapted for the western lifestyle. It eaches you the tools to find and then cleanse the emotional and mental blocks that dictate and limit your life. It gets you strong and centered by connecting you to your core and is particularly tailored to heal physical and emotional injuries. It does not require strength or flexibility; it only requires a willingness to learn how to feel authentically and respond honestly. The practice is founded on four pillars: Breath, Strength, Integrity and Spirit." Your days on board will be unforgettable. You can start the day with a swim before a fresh and healthy breakfast. Afterwards Katrin will lead you in your first yoga session of the day. While cruising to the next bay you may want to take a nap, read, or chat with your fellow travellers. Explore the land or have another swim before lunch. Local vegetarian dishes can be arranged upon request. Your next yoga class starts in the late afternoon, enjoyed with a spectacular sundown. Ah, can you feel what´s coming next… Nothing - but relaxing, dining, and feeling the sense of nature and the smell of seawater; feels great doesn’t it? And then it´s up to you where you prefer to sleep. We make a bet: You will end up sleeping outside under a stunning sky full of stars. Let your dreams flow before the next morning swim. After breakfast, disembark in Marmaris at 10:30 am at the latest. We trust that you will leave with nice memories and new friends. Please note that this is only an example. You are free to shape your day as you please. Also note that the route may vary slightly depending on weather conditions at the captain’s discretion. Updated for 2016. All our prices are based on Euro. First line: the price is for one person sharing a double cabin. All cabins have en-suite WC/shower. Single passengers who wish to have a cabin for themselves must pay the single occupancy price. 2 Yoga classes per day. bed linen and towels (small and bath towel). Beach towel is not provided. Optional land tours and entrance fees to places of interest. Please bring your own beach towles ! 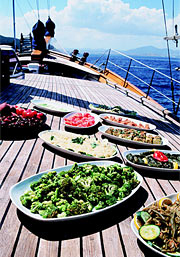 All yachts are between 19 - 25 meters in length and accommodate between 12 and 16 guests in 6 to 8 cabins. The cabins have en-suite WC & handheld showers (hot & cold). There is a music set, VHF Radiotelephone and a dinghy on each yacht, but in general no air conditioning. Crew consists of a captain, a cook and a deckhand. The yacht’s name will not be available until 1 - 2 days before departure to allow late bookings. We kindly request your cell phone number so that we can give you your captain's number and your boat name.